Enjoy many of the treats the North Shore of Lake Superior has to offer right from your backyard at beautiful Inspiration Haven. This property is private and close to the biking trail and Lake Superior Hiking Trail. Seating on the deck provides privacy as well as a view of Lake Superior. Enjoy the outdoors on your own private lawn. The woodwork in this cabin is true Northwoods. Warm up in this cozy living area after a day on the slopes . Tired from all your daily adventures Sit down and relax in front of the t.v. Enjoy the warm cabin decor. Extra seating for the little ones, too. Dining for 4 with room to spare. Kitchen equipped with full size appliances. Gas stove makes cooking a breeze. Plenty of cupboard space to stock up for your entire stay. Full size bathroom with tub/shower combo. Steep stairway to upper level. Queen size bed in upper loft area. Extra sleeping for guests or children. Bedroom upstairs allows for moonlit nights. View from loft. Washer and dryer available for guests to use. Grilling on the deck allows you be outside instead of in the kitchen . Cabin is in the heart of the Great North Shore. Across the road from Lake Superior. You can't beat this location! With easy access to trails, whether you desire to hike, bike, snowmobile, or ski, this quaint North Woods cabin is conveniently located near it all in Tofte, just minutes away from the Lutsen Mountain ski hill. Plenty of parking space for a trailer and all of your toys. Close (5-15 miles) miles to Superior National Golf Course, Lutsen Recreation Mountain and Ski Hill, Temperance River State Park and Carlton Peak with great trails and views. 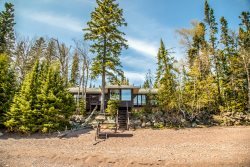 Short distance to Tofte Park on Lake Superior with boat access and ledge rock beach. Oberg Mountain with spectacular views just 4 miles away - connects to the Superior Hiking Trail. Cascade River State Park with gorgeous water falls and hiking just 15 miles away. Canoe, kayak, bike, snowshoe, ski, and snowboard rentals all available at nearby Sawtooth Outfitters. Fishing (Cook County, MN holds the state record for largest Salmon, Trout, Whitefish, and Walleye according to the DNR). Dining and shopping just 5+ minutes away. Grand Marais is just 30 minutes away with more shopping and recreational options, including daily sails aboard the schooner Hjordis. Our cozy North Woods cabin was built during the 1920's and much of the structure and woodwork are original. Tofte township was founded by twin brothers, John and Andrew Tofte. They arrived in 1893, sailing from their home of Tofte in the Halsnoy district of Norway. Our cabin is on a small hill in Tofte off of U.S. 61, which is the road that musician Bob Dylan referred to in the album and song Highway 61 Revisited. Eco Friendly - We use biodegradable cleaning products, premium organic cotton sheets, high-efficiency on-site washer/dryer, and other eco-friendly practices unique to our family cabin. These will enhance our guests' experience and also aid in the health of the environment. Caution - Steep staircase/ladder to loft.